Flowers, gardens, allergies, thunderstorms and floods — yes, it’s May in Nashville! Sound good to you? I can’t wait for you to read it. There will be all sorts of goodies upcoming, including excerpts, so stay tuned. Catherine’s Facebook page is the spot for all the great breaking news on this book. Had a lovely time at the Southern Kentucky Bookfest in Bowling Green. I was honored to meet Henry Winkler, who was as charming and sweet as you can imagine. You’d think he was a southern boy! And so many readers! There’s nothing like spending the day surrounded by authors and books. Thanks, SOKY! More news: The brand spanking new JTEllison.com is up and running. I hope you love the new look — clean and clutter-free, easy to navigate, and still full of the information you love. Let me know what you think! One of the major overhauls on the site was the Events page. Do check it out — and if you’re in the middle Tennessee area — come by the Williamson County Library on May 18 from 11-2 for a multi-author reception and signing sponsored by the Music City Romance Writers. If romance, YA, paranormal or romantic suspense is your thing, we’d love to see you. Refreshments and books and chatting with authors — what better way to spend a Saturday afternoon? And May 28, I’ll be hanging out in East Nashville with the East Side Story bookclub, talking about A DEEPER DARKNESS. RSVP to Chuck Beard 615-915-1808 if you want to join us! Every month there’s a new contest on my site. The May contest is live now — enter to win a signed copy of SO CLOSE THE HAND OF DEATH. Also, the Brenda Novak for the Cure of Diabetes auction is up and running. I have a super special treat for you — have you ever wanted to be in a book? I’m donating a character name to the auction, and you have your choice, be very very good, or very very bad. 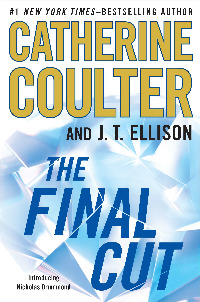 There’s also an advanced reader copy of THE FINAL CUT up for grabs, so get over there and start the bidding! I was watching Nick Stellino last Sunday and he made one of my favorites — Pineapple Upside Down Cake! There’s a video included with this if you’re interested — and I highly recommend watching — this is cooking with a cheerful Italian! Fast, delicious, and such a nostalgic treat! I hope your spring is glorious, your gardens lush, your cakes properly risen, and your reading divine. See you in June!